And reading that I can completely depict all of those scents. What I can say personally, is that it’s a refreshingly light scent, which isn’t fruity or floral but kind of in between with an almost creamy scent that hooks the back of your nose – in a good way! It’s an addictive smell. I found when I first sprayed it I kept catching a whiff and wondering what it was that smelt so amazing. One thing I have always found with perfumes is that I’m one of those people who can spray a litre on in the morning and the smell just disappears after about 10 minutes. With this though, it lasts ALL day, and I’m not even exaggerating. When I went into work one of the guys even picked up on it from across the desk, and I’d literally only sprayed it once on my neck. In fact, I can still smell it now. 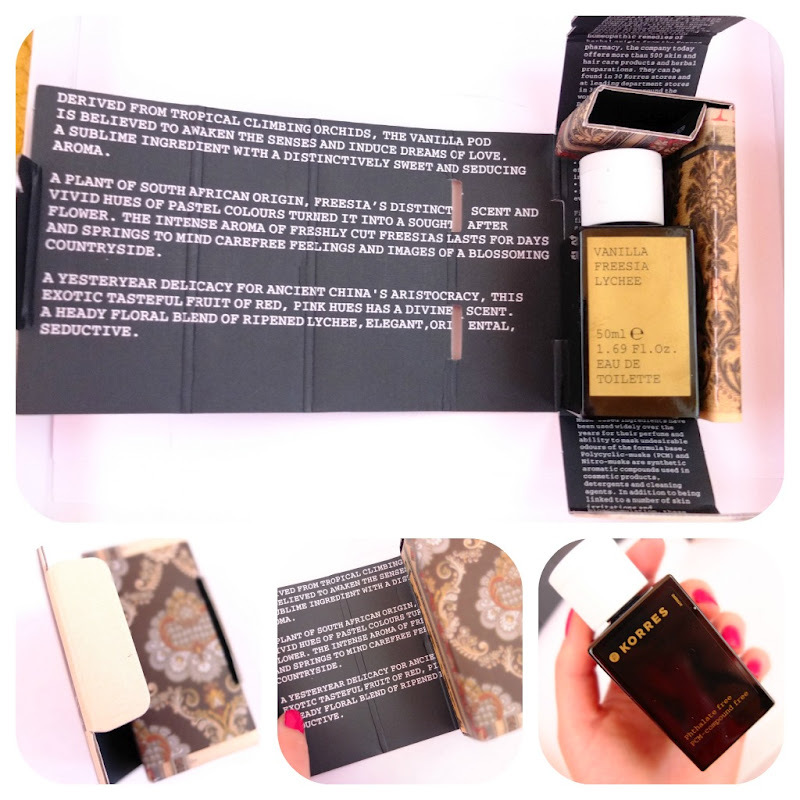 The other thing which wow-ed me about the Korres perfume is the packaging. It’s in a luxuriously thick fold out box, which just oozes quality. I love how it has a little story inside too. Reading packaging is my sad little happiness in life. For £29 you get a generously sized 50ml bottle. I was honestly expecting such a product to be closer to the £50 mark!! I think for a perfume this is so reasonable, when you consider other brands which aren’t are ‘special’ or unique retail for even more than that in Boots and the other scents from the range are going on my Christmas list straight away. You can buy this and the entire Korres range from Harvey Nichols. I’m their new biggest fan. Next Post A Few Lovely Things….